The Texans have not deviated from their Jadeveon Clowney plan. A franchise tag before Tuesday afternoon’s deadline is imminent. 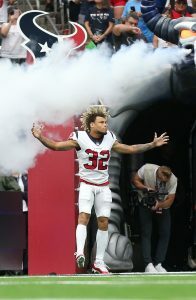 The team is still trying to keep Tyrann Mathieu off the market as well. Houston is making a push to retain Mathieu before he hits free agency, Aaron Wilson of the Houston Chronicle notes. No deal is imminent at this juncture, however. After the season ended, Mathieu indicated he wanted to be back with the Texans. Bill O’Brien said at the Combine he hopes a deal will be finalized. The team has the money to make that happen, holding more cap space ($80.9MM) than all but two teams. But the safety market appears to have restarted, after going to a strange place in 2018, and the former All-Pro will likely want a deal closer to the one he inked with the Cardinals in 2016 than the one-year, $7MM pact he signed with the Texans. Prior to Eric Berry‘s $13MM-per-year deal, Mathieu was the league’s highest-paid safety — at $12.5MM AAV. He may not be in position to land that, but with Landon Collins and Earl Thomas potentially set to be franchise-tagged (in Collins’ case) or sign a new big-money deal, the 26-year-old Mathieu may want to see what his market looks like. Eric Reid signed a deal far more lucrative than any team was willing to authorize last year, and Lamarcus Joyner is expected to hit free agency, too, pointing to an interesting signing period for this position. As for Clowney, he is not expected to sign his franchise tender soon after the Texans tag him, Wilson adds. His impending tag means the Texans have barely a week left with exclusive Mathieu negotiating rights. The legal tampering period begins March 11. 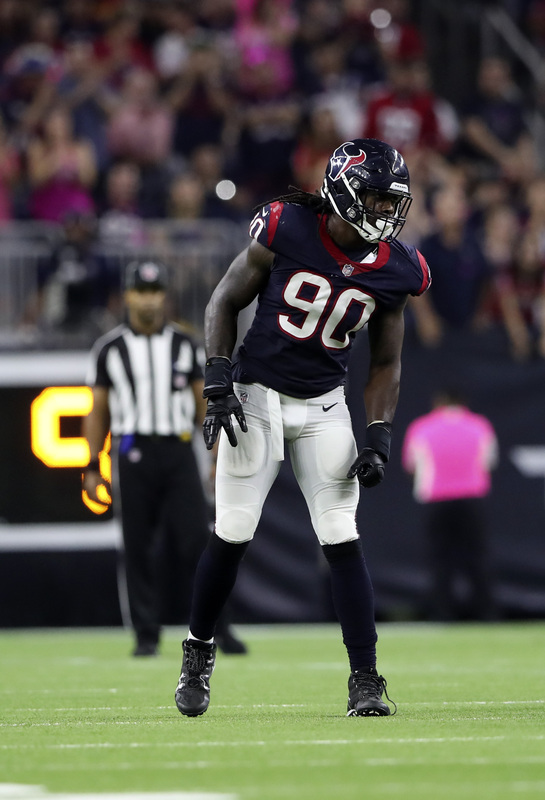 With Tuesday marking the first day teams can apply franchise tags to plays, the plan in Houston remains to tag Jadeveon Clowney. That has been the expected course of action for months. In addition to reporting the Texans are not deviating from their long-rumored strategy, Aaron Wilson of the Houston Chronicle notes an extension could be complicated. The Texans are not planning to pay “anywhere near” as much as Khalil Mack and Aaron Donald received when they reset the defender market last summer. Interestingly, the Texans could afford a Clowney deal on the $23MM-AAV level. The team holds more than $77MM in cap space. It will cost north of $17MM to tag the 25-year-old standout. Clowney, who of course was drafted ahead of Mack and Donald in 2014, now has three Pro Bowls to his credit. He has posted back-to-back nine-plus-sack seasons. While the South Carolina product has not shown himself to be on the level of Mack or Donald, his negotiations coming in a year when the cap is expected to approach or exceed $190MM works in his favor. However, unlike the Bears and Rams, the Texans already have a pass rusher, J.J. Watt, on a high-end contract. That $16MM-AAV deal, now that Watt re-emerged as one of the NFL’s best players, may need to be revisited soon as well. Texans senior vice president of football administration Chris Olsen plans to meet with Clowney’s agent at the Combine next week, Wilson adds. That will provide a clearer measurement as to how close the sides are. A report earlier Monday indicated Clowney’s work ethic may cause additional hesitancy regarding a long-term deal. But health-wise, the back half of Clowney’s rookie contract helped change his narrative. An injury risk earlier in his career, Clowney has shed those concerns over the past three seasons. After playing in 30 regular-season games from 2016-17, Clowney missed the Texans’ offseason program last year due to knee surgery. He played in 15 games this past season. The gap between the Mack-Donald tier and Von Miller ($19MM per year) is significant, and while Clowney has not produced on Miller’s level, it should be expected he will want a deal perhaps well north of the Broncos superstar’s pact — considering Miller’s extension occurred when the cap resided at $155.27MM. Antonio Brown has scared off at least one interested team with his tweets, Peter King of NBC Sports hears. The Steelers star hasn’t been shy about airing his dirty laundry over social media and King suspects that other potential suitors are also viewing his outspokenness as a red flag. Brown’s latest Twitter outburst included shots at coach Mike Tomlin and quarterback Ben Roethlisberger, which jibes with reports of serious friction between Brown and key team figures in recent months. Over the past 40-plus days, Brown has requested a trade and been involved in a domestic dispute. Meanwhile, he’s denied any wrongdoing in connection with the incident. King is skeptical of the Texans reaching a long-term deal with Jadeveon Clowney this offseason because he’s “not as hard of worker bee some others on that defense are.” However, that could change if Clowney receives the franchise tag and proves himself in 2019. 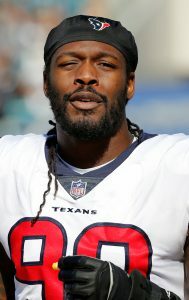 Clowney recently earned a payment of $1.005MM to resolve a dispute over the position designation for his fifth-year option, so he’d earn roughly $17.3MM under the terms of the tag. The Raiders have three first-round picks and there has been speculation that they could target a quarterback early in the draft, despite the presence Derek Carr. The Raiders, King hears, are fascinated with Murray. If that’s the case, he wonders whether Oakland might flip Carr to to the Jaguars, Dolphins, or Redskins and select the Oklahoma star. If that happens, Murray could wind up playing his first home games on the field of the Oakland A’s. Although their playoff opener is not going too well thus far, the Texans entered Saturday with clear offseason goals. They want both Jadeveon Clowney and Tyrann Mathieu to be part of their 2019 team. While re-signing both long-term may be difficult, that is the path Houston wants to take, Ian Rapoport of NFL.com notes (video link). Both defenders are set for free agency come March. Talk of a Clowney extension cooled off considerably in 2018, when the standout defender was battling another knee injury. But he has played well this season, making his third straight Pro Bowl. The Texans want to, at the very least, keep Clowney around for 2019 via the franchise tag. Rapoport calls that move a “very viable option.” This has been rumored for a bit now, even though it is not the Texans’ preferred option. This would force the Texans to re-sign Mathieu long-term, if they want to keep him around. That’s a scenario the former All-Pro safety is interested in unfolding. With the safety market taking odd turns this year, Mathieu had to settle for a one-year commitment. It’s likely he will be able to do better in 2019. Earl Thomas, Landon Collins, Lamarcus Joyner, Tre Boston, Kenny Vaccaro and Ha Ha Clinton-Dix may hit the market, or at least a few members of this group. That would make for another interesting offseason involving safeties. As for Clowney, his asking price surely spiked when the deals for Aaron Donald and Khalil Mack were finalized. Houston is projected to possess $72MM-plus in cap space, which is in the top 10. The Texans already extended Benardrick McKinney and will have Deshaun Watson becoming extension-eligible after this season. And after J.J. Watt reclaimed his place on the All-Pro first team, the Texans will probably have to carve out room for another major extension for the three-time defensive player of the year. The Texans aren’t letting Jadeveon Clowney get away. The team plans to apply the franchise tag to him for 2019, as Jason La Canfora of CBSSports.com writes. However, the move may come with some controversy. 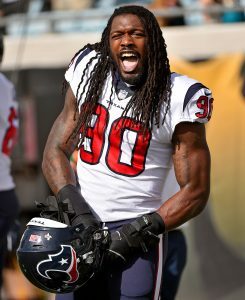 Clowney will argue that he should be tagged as a defensive end, which would put him in line for more than $17MM in salary. Meanwhile, the Texans will contend that he is a linebacker, which would give him about $15MM. The difference is relatively small, but it could be a major point of contention for Clowney and an opportunity for the Texans to gain a bit of cap relief. Beyond the tag, the two sides will find themselves in an interesting long-term contract negotiation. 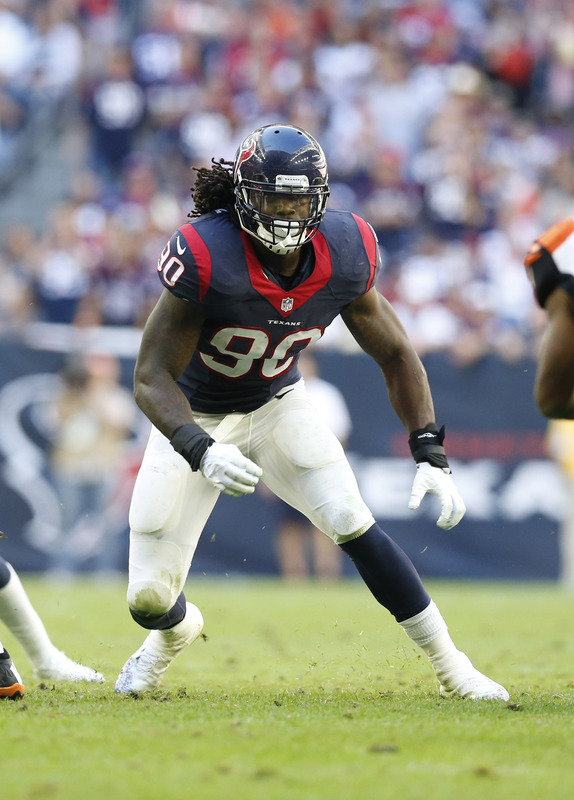 When on the field, Clowney is among the league’s most feared edge rushers. Since the start of the 2015 season, Clowney has recorded 25.5 sacks and 55 tackles for a loss. And, this year, he has been one of the NFL’s best at generating quarterback pressure, but his injury history may be something of a concern: The 25-year-old (26 in February) missed 3/4ths of his rookie season and a few games in ’15 and ’16. Then again, he has back-to-back Pro Bowl nods and appeared in all 16 regular season games last year. On Sunday, Clowney recorded yet another sack as the Texans edged the Redskins, 23-21. Next, the Texans will take their seven-game winning streak to the Titans on Monday night.